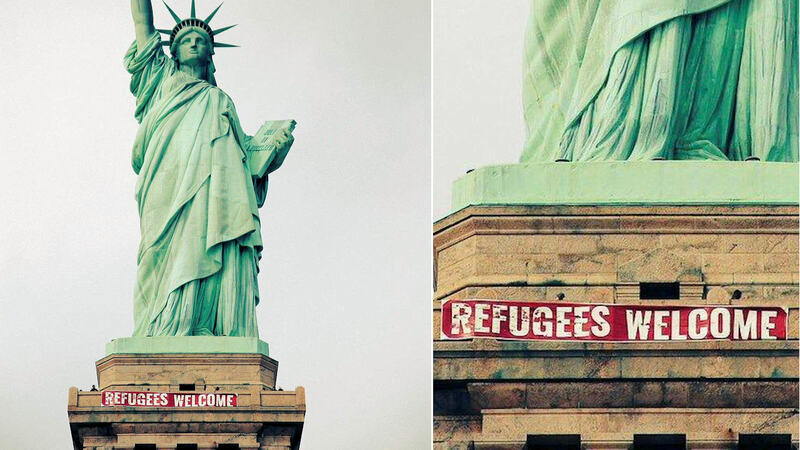 LIBERTY ISLAND -- A banner reading "Refugees Welcome" was unfurled on the Statue of Liberty Tuesday afternoon. The banner, approximately 20 feet by 3 feet, was spotted on the pedestal just before 1 p.m., affixed by nylon rope to the wall of the public observation deck at the base of the statue. Rangers, alerted to its presence, immediately made their way to the location and conducted an assessment of the banner and how it was attached to the monument. It was determined that the banner could be removed without damaging the pedestal, and Rangers began the process of removing it. Officials remind the public that affixing a banner to the national monument is strictly prohibited, and an investigation is underway by the United States Park Police to identify suspects.